We are pleased to announce the new Stock X-Ray Data Service for use with the Stock Investment Guide software. Make sure to read our information page about this new service here. With the X-Ray Data Service, you can unleash the power of the Stock Investment Guide! We are also adding the domain name StockXray.com because it was too cool to pass up. Our old domain Churr.com will continue to work as always (they both point to this site). A must for the individual investor, stock club member, or professional investor. The Stock Investment Guide (SIG) works with the internet in unique ways, using exclusive features to understand the quality of potential investments. Users can view historical price graphs, research company news, research competitors, view SEC filings, get earnings estimates, and research technical analyses on the internet. Easily share your analysis results with others using the standard .ssg data file format. You can also import .ssg data files from friends or stock club members to learn more about investing and stock analysis. Printing reports with the Stock Investment Guide is even easier. You can print a standard 2-page stock analysis report, a condensed Stock Summary Report (SSR)™, company performance graphs, plus all of the online research data available in SIG. As you become successful in your investment strategy, your portfolio value continues to grow. Eventually, the value of your portfolio far exceeds the value of any new investments being added to the portfolio. The importance of sound portfolio management increases as the value of your portfolio continues to grow. Churr Software developed the Portfolio Analysis Review (PAR), a software tool integrated into SIG 4.0 to analyze the stocks in your portfolio. Learn more about PAR‘s great features. The Comparison Analysis Review (CAR) software allows users to perform a side-by-side comparison of up to four completed stock analyses. 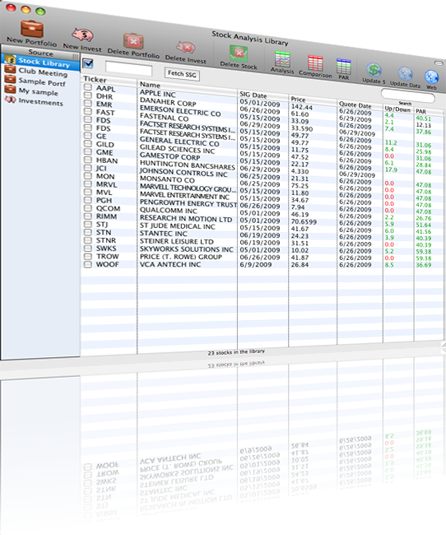 CAR uses SIG’s .ssg data files to present four stocks on a single page, where users can highlight the best company based on each factor in the analysis. CAR is now integrated into SIG 3.0.